The 14-mile-wide (22 kilometers) eye of Super Typhoon Soudelor is clearly visible in this optical image of Soudelor captured by NASA's Aqua satellite on Aug. 4, 2015. Prying eyes from space have helped to observe and characterize the most powerful storm of the year to date. NASA's RapidScat instrument aboard the International Space Station and the agency's free-flying Aqua satellite peered down to observe Super Typhoon Soudelor, which registers as a Class Five typhoon — the highest classification on the Saffir-Simpson Wind Scale. The storm, which has smashed its way across the western Pacific Ocean this week, boasts wind gusts of up to 220 mph (354 km/h). RapidScat gathered information about the typhoon's surface wind speed and direction Monday (Aug. 3) at 3 p.m. EDT (1900 GMT), as the storm churned just west of the Mariana Islands. The sustained winds at that time neared 155 mph (250 km/h), NASA officials said. Meanwhile, Aqua's MODIS (Moderate Resolution Imaging Spectroradiometer) instrument gathered a visible-light image of Soudelor at 12:10 a.m. EDT (0410 GMT) today (Aug. 4), revealing the storm's 14-mile-wide (22 km) eye. 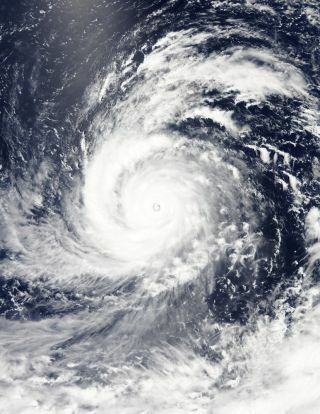 The photo shows thick clusters of thunderstorms spiraling into the center from Soudelor's outer edges, while the super typhoon whirled about 860 miles (1,380 km) southeast of Okinawa, Japan. Soudelor is expected to weaken before it makes landfall in southeastern China on Saturday (Aug. 8), NASA officials said. No deaths have been attributed to the massive typhoon to date. Incidentally, the terms "typhoon" and "hurricane" refer to the same phenomenon. Powerful storms are called "hurricanes" when they occur in the Atlantic and northeast Pacific regions, "typhoons" in the northwest Pacific and "cyclones" in the south Pacific and Indian Ocean regions. For forecast warnings from the Japan Meteorological Agency, visit: http://www.jma.go.jp/jma/indexe.html. For warnings and watches for Taiwan, visit the Central Weather Bureau website: www.cwb.gov.tw/eng/. For warnings in China, visit the China Meteorological Administration website: www.cma.gov.cn/en.